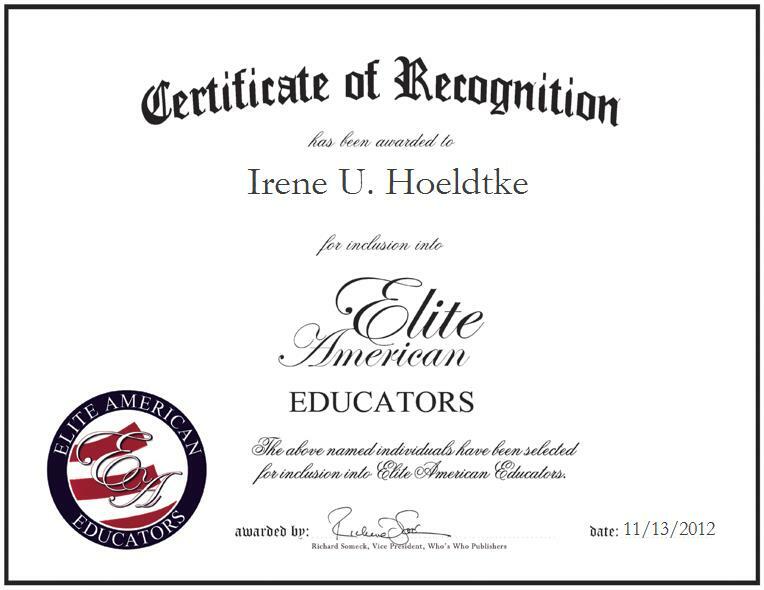 Irene U. Hoeldtke is an educational consultant offering educational curriculum and instruction, as well as assistive technology. At her current post, Ms. Hoeldtke is in charge of diagnosing children with special needs or learning disabilities, developing curriculum and instruction plans for all different disabilities, and helping them to benefit from education. She also oversees high school and junior high school students who have severe and profound special education problems, and conducts meetings with therapists, principals and parents on how to develop an education plan for these students. Ms. Hoeldtke has been a consultant to the present director of special education for five school districts in the heart of Texas Cooperative for Exceptional Children. She is a mentor for a university student pursuing her license in school psychology and teaches counseling and testing of students with psychological and emotional problems. She is the head of an assisted technical team for a whole cooperative of five districts and travels as a team with physical, occupational and speech therapists to evaluate and help children improve. For her outstanding efforts, Ms. Hoeldtke was bestowed with the Teacher of the Year Award.